Wonderfully wild, Gilded Tomato’s food truck catering will work out magic for your wedding! If you are planning your wedding check out how Gilded tomato’s food truck catering is a real find at an excellent value and price! Just because you’re on a budget doesn’t mean you need to compromise on entertainment and quality, especially that day being the most important day of your life! Our food truck catering offers unbelievable live-fire cooked menu options. Our vast array of menu includes our signature wood-fired grilled pizzas and a multitude of entrees and appetizers all charmingly cooked in our renowned mobile ovens, “Gilda” and “Gatsby” under the crackling sounds of wood. A spectacle at an affordable value! “People eat with their eyes first”, so we focus on the presentation! One of the most exciting parts of live-fire cooking that Gilded Tomato is renowned for is that it is an interactive experience – this is designed to entertain your guests! Our pizzas are baked until their underside have the telltale “leopard speckling” – in all of an amazing 90-seconds! Our show is TANTALIZING! Fire-masters revitalize the ambience while working in the copper clay oven…take in the hickory wood aroma…the fire is aglow…and your guests gather near under the moonlight…a perfect wedding is yours! Let us make it a seamless and amazing experience for you and your guests. Adventure calls and our food truck catering has it all! The wedding catering cost in your Rhode Island wedding can take all the romance away! We’ll show you 6 sure fire ways that Gilded Tomato’s live-fire wedding catering can smarten up your wedding budget! Our one-of-a-kind mobile clay ovens offer live-fire entertainment for less! Your guests will see, hear and taste the difference of our live- fired cooked courses and pizzas. Our artisan staff will delight your guests by cooking in front of them under the crackling aromas and earthy sounds of wood. Our show is MESMERIZING! Fire-masters skillfully work the copper clay oven…take in the hickory wood aroma…the fire is aglow…and your guests gather near under the moonlight…a perfect wedding is yours! Let us make it a seamless and amazing experience for you and your guests. Have an extraordinary wedding catering in Rhode Island this summer! Our Chef will swap pricy items with less expensive ones and will work with you throughout the process. For instance, we will tempt your palate with open fire cooked calamari to instead of lobster offering outstanding taste without breaking the bank! Also try our LIVE-FIRE SKEWERS at your event! Make this a main dish or an appetizer. We will put together colorful and mouth-watering combinations of beef, bison, chicken, shrimp, veggies, pineapple with special marinades. The imparted taste of hickory wood will tantalize your taste buds and add a great twist to your wedding catering in Rhode Island! Food truck catering has just taken a whole new dimension under Gilded Tomato’s new Executive Chef, Jori Rieben. There is no consensus on how to become a great chef. Some rely on experimentation, intuition and tradition – as well as the guidance of the heart and the stomach – to inform their style. Others take a decidedly technical approach, pursuing rigorous educations that establish theory, order, method, chemistry and nutrition as the frameworks of their Jӧri Rieben’s nontraditional path upwards through the culinary world has given him a balanced perspective on just what it means to prepare and serve a meal. Rieben is the Executive Chef of Gilded Tomato a unique duo of hand-crafted mobile clay ovens, namely “Gilda” and “Gatsby” most likely seen at Blackstone Park’s summer Farmer’s Market. They truly are not your average cookie cutter food truck and offer distinct catering that will make your next event shine! Rieben’s longtime love of food had organic, emotional beginnings. As a child in Spring Valley, NY, Rieben would watch spellbound as his father joyfully prepared meals for family and friends. The elder Rieben’s enthusiasm spilled over, and young Jӧri came to love the food and the process, eagerly assisting his father with what needed to be done. The family moved to Switzerland when Rieben was 10, and by the end of high school, he had secured a three-year apprenticeship at Restaurant Am Gallusplatz, a fine-dining restaurant in the city of Saint Gallen. Rieben stayed on for another year after the apprenticeship, before reporting for his compulsory Swiss military training. During his training Rieben managed to work his way into the kitchen, even staying on in a culinary role at the military for another half-year after his training. After that Rieben took on a roughly six-month engagement aboard the cruise ship MS Europa. After another stint at Am Gallusplatz, Rieben decided to return to the United States, landing in Rhode Island and finding no shortage of need for his skills around the state. 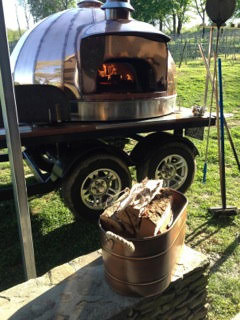 Great for any occasion our wood fired-pizza ovens will thrill you and your guests! Julia Sweet, the owner, is passionate for anything wholesome and has employed two hand-crafted clay ovens, namely “Gilda” and “Gatsby” to bring this unique entertainment to Rhode Island and Southern Massachusetts. She also loves to grow her own herbs at her farmstead in Rehoboth, the enticing smells of which you can trace to Gilded Tomato’s signature sauce on all their savory wood fired pizzas. 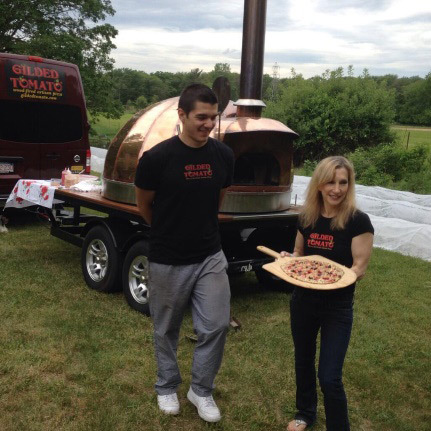 Far away from your average “cookie cutter” catering options available in the Rhode Island and Massachusetts regions Julia and her passionate team offer a truly distinct catering option: Gilded Tomato’s live fire cooking and their much sought after wood-fired pizzas. Excellent meats, seafood and artisan vegetables are also cooked over an open live fire grill. Classically elegant the ovens are a true feast to the senses and since nothing entertains guests like the flames of an open fire cooking your banquet will have all the right ingredients for a once-in-a-lifetime experience. he savory aromas of excellent food cooking, our complete sound system playing the background music of your choice, unlimited Birch Beer and amazing foods handcrafted specifically to your criteria for your perfect event. We offer both savory and dessert pizzas, individually crafted one by one, from the finest and freshest ingredients. Our dough is made using a three-day cold fermentation process, created by our mentor and friend, Ciril Hitz, an award-winning master baker and professor at Johnson and Wales University. Finely crafted with 100% Molina Caputo flour, indisputably the world’s best, San Marzano tomatoes, savory olive oil and sprigs of fresh herbs our wood-fired pizzas are second to none and will transform your banquet to a truly pleasurable experience. The Gilded Age of Wedding Catering is here! Life’s most treasured moments can now be part of a “Gilded Age,” with the luxurious wedding catering packages by Julia Sweet and her company, The Gilded Tomato. 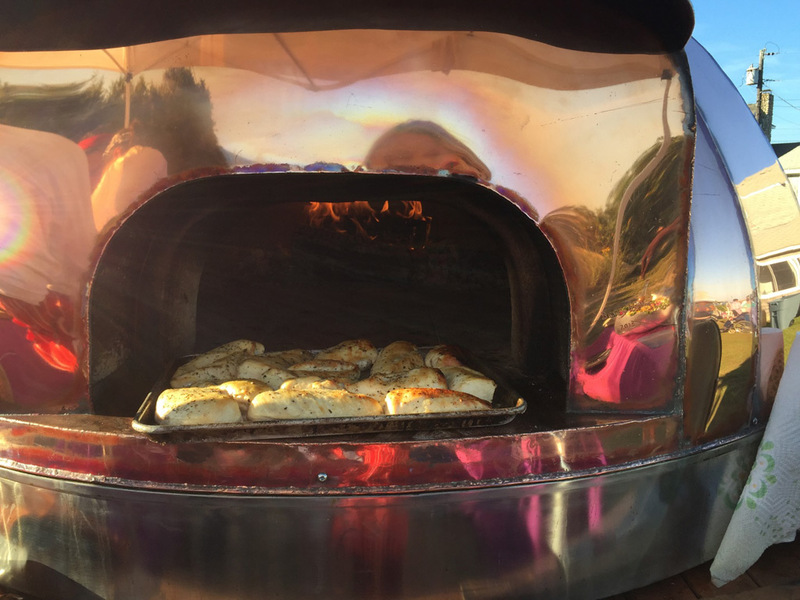 The moveable ovens offer live-fire cooking entertainment of the highest sort and have written a new chapter in wedding catering in Rhode Island of which F. Scott Fitzgerald would surely approve. 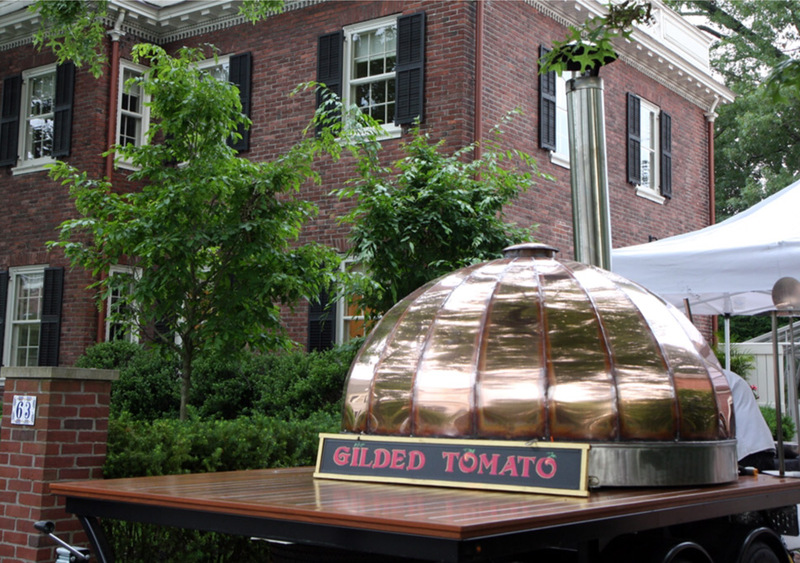 “Gatsby” or “Gilda” – bespoke, mobile wood-fired copper and clay pizza ovens – will be transported to your home or other venue where 50 guests will experience a truly unique catered affair. Specially trained artisan chefs and catering staff will delight guests with demonstrations of “live fire” cooking of hand-crafted savory and dessert pizzas, complimented by gourmet salads. To be expected, all ingredients are locally sourced and organic wherever possible. Gilded Tomato’s wondrous offerings are a true mozaic of color – we have taken pizzas and infused them with nutrition – some wholewheat in the dough, vegetables infused into the San Marzano sauce, heart-healthy olive oil, fresh herbs…and maybe a drizzle of hot honey. We start with 100% Molina Caputo flour, indisputably the world’s best. San Marzano tomatoes, savory olive oil, sprigs of fresh herbs are some of the ingredients in our special sauce. We top your pizzas with as many local, natural and/or organic vegetables as feasible. During the final prep stage, the pizzas are then placed on an organic brown rice floured wooden peel and placed into the oven. As you can see, making artisan pizza is a labor of love! Gilded tomato’s wedding catering menu will help you create powerful memories of a lifetime on the most important day of your life, your wedding day! Our distinguished culinary team will enthrall your guests with a once-in-a-lifetime spectacle: live-fire cooking in old-world European ovens. Our versatile ovens fire up to 1200 degrees and through the artistry of live-fire cooking from our virtuoso chefs deliver up a magnificent array of foods with the smoky signature of crackling wood. Think of the intense taste of burning wood undersigning our dishes like Maine Lobster, Roasted Wild Mushroom Medley, Herb Ricotta with Arugula and of course of course our legendary Margherita. Standing around our wood-fired ovens, your guests will be swept along by the performance of our virtuoso chefs as they watch their food cooked in live fire and burning wood within minutes! Call us and see how you can amp up your party or function! Conveniently located at our farmstead in Rehoboth, MA, we are in close proximity to any town in Rhode Island and Southern Massachusetts, making us the ideal caterer that will take the guesswork out of your party and do it all for you at an affordable rate! We cater to all dietary needs offering sensational signature pizzas, savory meat, seafood, and vegetarian appetizers, and mouth-watering dessert pizzas. But we won’t stop there! Our acclaimed appetizers such as wood fired pita chips accompanied by fire-roasted garlic, red pepper or eggplant hummus, or live-fired shrimp in raspberry chipotle sauce will transcend any common starter! Food truck catering by Gilded Tomato: perfect for your wedding! Live fire cooking is on everyone’s lips, and our food truck catering menu offers just that! Just stand back and watch while our chefs and fire masters offer live fire culinary entertainment to your guests offering extraordinary pizzas appetizers, entrees, desserts with the unique aromas of wood. Our ever-popular mobile ovens have undersigned an array of weddings, parties and private functions delivering fresh, piping hot (and safe) food in record time- pizzas pop out in just 90-seconds! We can feed a crowd quickly when catering private events, weddings, festivals, and corporate events. Our new Executive chef’s signature wood-fired pizza will be welcomed by all! Gilded Tomato announces Jori Rieben as our new Executive Chef, great news for the wood-fired pizza lover. Jori Rieben’s culinary philosophy is simple; cook what you love to eat. And what does Chef Rieben love to eat? Clean, seasonal food with a French flair, an all-American sensibility, and a playful nod to his Swiss roots. Born in Spring Valley, New York, Rieben moved with his family to his parent’s native land of Switzerland when he was 10 years old. “We relocated because my father’s job was transferred. He’s a banker, but we knew him at home as the one who does the cooking”. Rieben was fascinated by his father’s natural ability to feed scores of friends and extended family members effortlessly while enjoying himself, as well. The young Rieben was hooked on the joy and camaraderie of cooking and began assisting his father during meals, learning the basics.” culture. Why take chances? 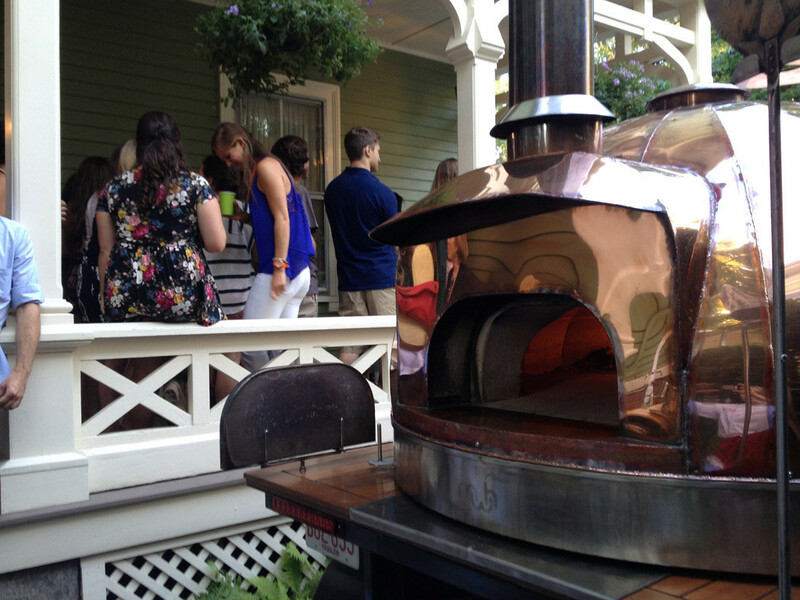 Rock your next event with our European wood-fired pizza ovens! Turn the catering of your banquet into a spectacular one under the enchanting smells of our signature wood-fired pizza hand-crafted and cooked in Gilded Tomato’s infamous European clay ovens. We offer both savory and dessert pizzas, individually crafted one by one, from the finest and freshest ingredients. Our dough is made using a three-day cold fermentation process, created by our mentor and friend, Ciril Hitz, an award-winning master baker and professor at Johnson and Wales University. Finely crafted with 100% Molina Caputo flour, indisputably the world’s best, San Marzano tomatoes, savory olive oil and sprigs of fresh herbs our wood-fired pizzas are second to none and will transform your banquet to a true feast for the eyes! Our mobile ovens and savvy team is exactly what you need to rev-up your banquet! Highly regarded by multiple event spaces we can set up on any solid hard-packed ground at the event space of your choice. We guarantee enjoyment for hours to come and suggest that your party size is 50 guests to make the most out of your budget. We are also chosen by smaller more eclectic parties for intimate gatherings! Our two ovens (“Gatsby” and “Gilda”), we can accommodate a very large group with two full cooking crews. Some of our private events have served 400-plus guests. Get more out of your budget with our affordable fee structure as a typical wedding dinner fee with full menu (savory and dessert pizzas, non-alcoholic beverages, salad, paper goods) and additions (appetizers, coffee service). So much more than food truck catering, our live-fire cooking mobile ovens are the latest word in weddings! Our hip mobile ovens offer so much more than food truck catering! Until now, only a fortunate few have experienced the distinguished taste of Gilded Tomato’s wood fire oven pizzas and food. Our wood-fired mobile ovens are beautifully encased with eye-catching copper. 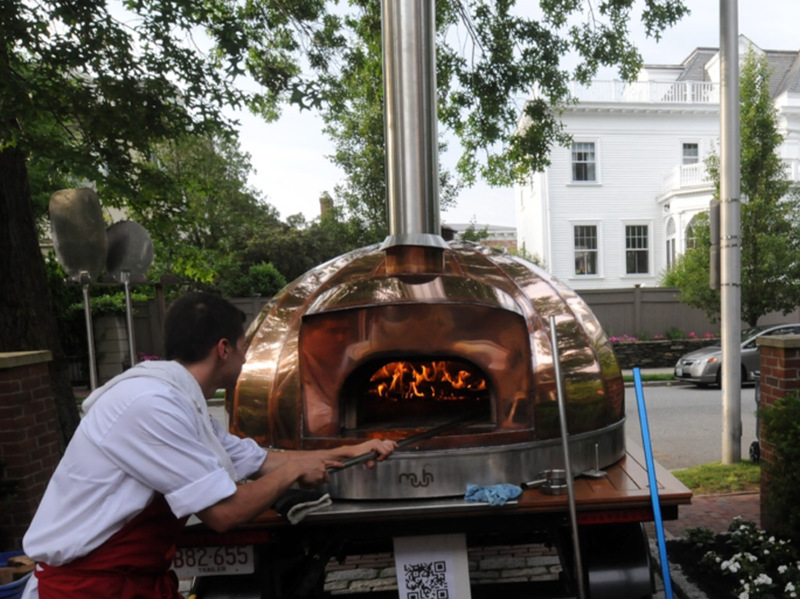 Our passionate team now caters to Rhode Island and Massachusetts wedding events offering an eclectic catering menu of wood grilled artisanal pizzas, local farm-grown natural and organic vegetables, meats and seafood appetizers, all fired up in our ovens with the crackling aromas of hard wood. Gilded Tomato’s extensive repertoire of wood fired pizzas will dazzle your guests as they watch it cooked before their eyes with the magic of the wood fire oven. Faithful to perfection, our dough is made by our international award-winning master baker. The pizzas revered taste is derived from a combination of using the freshest and most natural of ingredients – much of which comes from our very own farm in Rehoboth, MA – where we tenderly care for what will be served to you and your special guests. We are truly farm-to-table! But we don’t stop there! Our virtuoso Chefs will thrill you offering savory meat, seafood, and vegetarian appetizers, and mouth-watering dessert pizzas. Experience stunning appetizers such as wood fired pita chips accompanied by fire-roasted garlic, red pepper or eggplant hummus, or live-fired shrimp in raspberry chipotle sauce. Copyright © 2018 Gilded Tomato Company. All rights reserved.